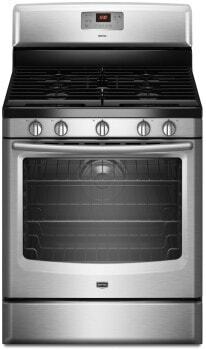 Maytag MGR8775AS 30" Stainless Steel Gas Range 5.8 Cu. Ft. Depth without Handle 25 7/16"
Depth with Door Open 90Â° 47 15/16"
Industry Leading 5.8 cu. ft. Capacity From everyday meals to large family feasts, count on the industry-leading 5.8 cu. ft. capacity to meet all your cooking needs. 17,000 BTU Speed Heat Burner With 17,000 BTU of power, the Speed Heat burner is perfect for handling large cooking jobs such as searing steak or quickly boiling water. Plus, it provides the power and flexibility expected of Maytag brand. 10-Year Limited Warranty on Burners and Grates A 10-year limited parts warranty on the die-cast metal grates and cooktop and oven burners ensure long-lasting performance. Designed, Engineered and Assembled in the USA From Oklahoma to you, Maytag ranges are designed, engineered and assembled in the U.S.A.
EvenAir Convection A fan evenly circulates air, providing a consistent oven temperature for uniform browning, even baking and faster roasting. AquaLift Self-clean Technology This innovative coating on the oven interior activates with water and heat, to release tough baked on soils, from underneath so food and debris easily wipe away. 3 Oven Racks (2 Standard - 1 Max capacity rack) The Max Capacity oven rack is recessed to provide maximum cooking capacity, which is perfect for large items and holiday meals.